CHICAGO (AP) – The Blackhawks and their marquee players are starting to get in a groove. And Chicago is starting to look like the team that won three Stanley Cups in the last seven seasons. Patrick Kane scored three goals for his third career hat trick to lead the surging Blackhawks past the Arizona Coyotes 6-3 on Thursday night for their third straight win and eighth in nine games. Kane has 23 goals to lead Chicago, which closed three points behind first-place Minnesota in the Central Division and Western Conference. “Anything can happen here down the stretch, but I think we like the way we’re playing, especially the last 10 or so games,” said Kane, last season’s MVP. “Gotta be feeling good about what we have in this locker room. The Blackhawks suffered a few defensive lapses on Thursday. But with Kane in prime form, they used their skill and puck control game to take charge in the second and third periods. In its last nine games, Chicago has outscored opponents 40-22. Vrbata, who played for the Blackhawks before they became one of the NHL’s top teams and won championships in 2010, 2013 and 2015, was impressed by Chicago in Thurday’s loss. Chicago’s Corey Crawford made 34 saves. Arizona’s Mike Smith stopped 23 shots, but neither he or many of his teammates were especially sharp. Blackhawks defenseman Niklas Hjalmarsson left after skating five shifts in the first period. After the game, Quenneville said Hjalmarsson had suffered an upper-body injury earlier in the day. Hartman connected from the low edge of the right circle at 10:28 to make it 2-1. Kane extended Chicago’s advantage to 3-1 just over six minutes later on sharp-angle shot than banked in off Smith’s torso on the short side. Vrbata was alone at the edge of the crease and tapped in Martin Hanzal’s feed from the left boards with 1:21 left in the first. Rozsival and Kane scored in the second to put Chicago back in front, 5-3. Rozsival trailed in and fired a shot past Smith’s glove 2:56 into the period after taking a pass from Schmaltz. 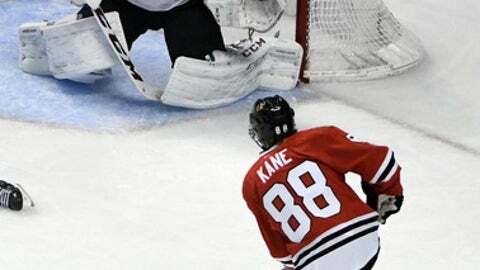 Kane completed his hat trick at 9:49 of the third. NOTES: Blackhawks rookie C Vinnie Hinostroza was a scratch. … Rozsival returned to the lineup after sitting out 14 games – six because of a foot injury and eight as a healthy scratch. … Arizona D Anthony DeAngelo was in the lineup following his recall from Tucson of the AHL on Monday. He filled a spot created after the Coyotes D Michael Stone was traded to Calgary for draft picks. … Arizona G Louis Domingue returned to back up Smith after being injured (lower body) for three games. Blackhawks: Host St. Louis on Sunday.